A Trent alumnus has helped identify the final resting place of human remains from the Franklin Expedition and hopes to soon be able to add to a list of confirmed crew members from the ill-fated search for the Northwest Passage. 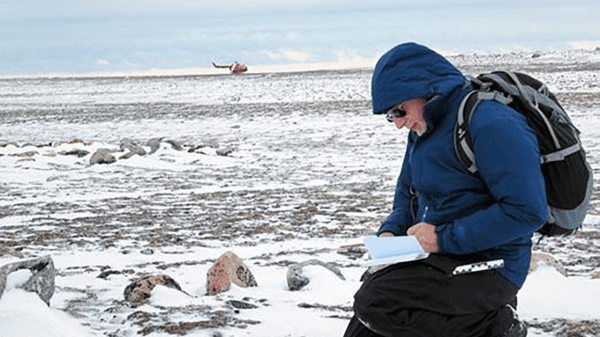 Dr. Douglas Stenton ’80, former heritage director for the territory of Nunavut, used comparisons between present-day and historical maps – as well as modern metal detectors – as a means of continuing the search for Franklin Expedition graves. He and his colleagues, including Dr. Anne Keenleyside of Trent University, will now study the remains to further confirm their findings. Dr. Stenton and his team also unearthed artifacts believed to belong to expedition crew members. The recent finds are the latest for the decorated archeologist.